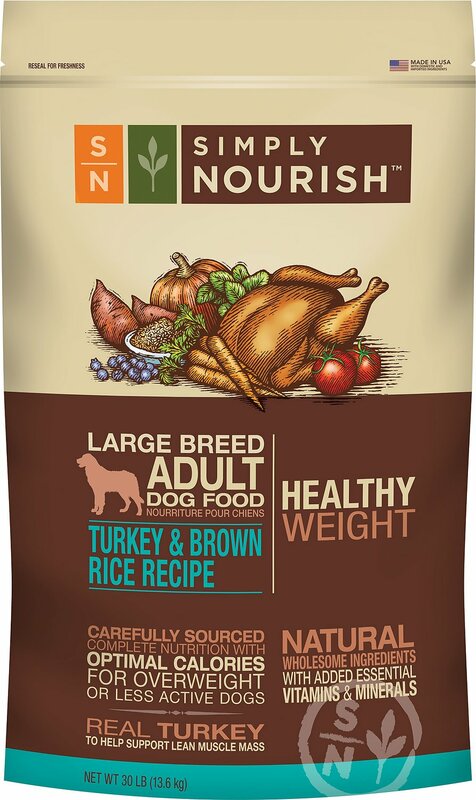 Feed your best friend the nutrition he deserves with Simply Nourish Healthy Weight Turkey & Brown Rice dry dog food. This weight-management formula contains the right amount of calories, high-quality, lean protein from real deboned turkey and L-carnitine to help support strong, lean muscles while maintaining optimum body weight. With a natural source of glucosamine and chondroitin from turkey meal, the large breed formula helps support your pal’s healthy joints. It includes a superfood blend of real fruits and vegetables like carrots, spinach, sweet potato, pumpkin and blueberries for a deliciously complete and balanced meal that's also filled with antioxidants. Plus, the adult kibble has added vitamins and minerals every dog needs. 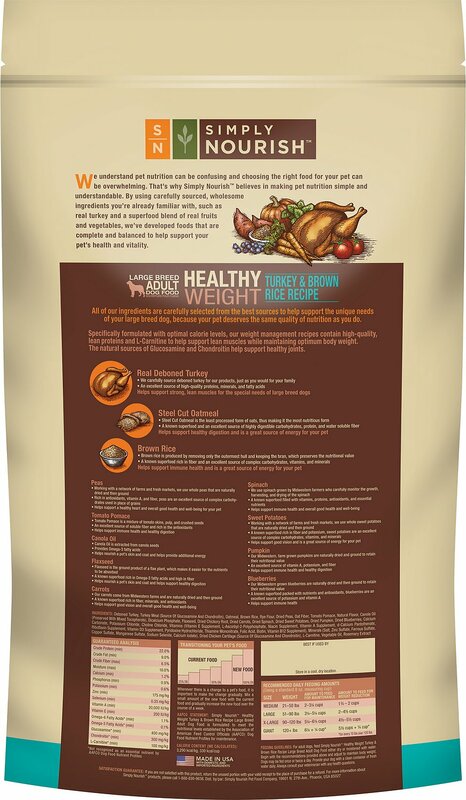 Real deboned turkey and turkey meal for a nutritious source of protein and L-carnitine to help maintain a healthy body weight in overweight or less active dogs. Adult kibble for large breeds with a natural source of glucosamine and chondroitin for healthy joints. Made with brown rice, which provides your dog with those complex carbohydrates that will keep him full for hours. Deboned Turkey, Turkey Meal (Source of Glucosamine And Chondroitin), Oatmeal, Brown Rice, Rye Flour, Dried Peas, Oat Fiber, Tomato Pomace, Natural Flavor, Canola Oil (Preserved with Mixed Tocopherols), Dicalcium Phosphate, Flaxseed, Dried Hickory Root Dried Carrots, Dried Spinach, Dried Sweet Potatoes, Dried Pumpkin, Dried Blueberries, Calcium Carbonate, Potassium Chloride, Choline Chloride, Vitamins (Vitamin E Supplement, L-Ascorbyl-2-Polyphosphate, Niacin Supplement, Vitamin A Supplement, d-Calcium Pantothenate, Riboflavin Supplement, Vitamin D3 Supplement, Pyridoxine Hydrochloride, Thiamine Mononitrate, Folic Acid, Biotin, Vitamin B12 Supplement), Minerals (Salt, Zinc Sulfate, Ferrous Sulfate, Copper Sulfate, Manganese Sulfate, Sodium Selenite, Calcium Iodate), Dried Chicken Cartilage (Source of Glucosamine And Chondroitin), L-Carnitine, Vegetable Oil, Rosemary Extract. For adult dogs, feed Simply Nourish either dry or moistened with water. Begin with the recommendations provided above and adjust to maintain body weight. Dogs may be fed once or twice a day. Provide your dog with a clean container of fresh water daily. Always consult your veterinarian with any health question. Wash hands with soap and warm water after handling. At last, a chicken-free / corn-free formula for large dogs who need help losing a little weight. 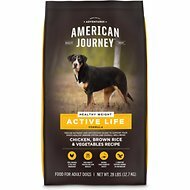 If I could change anything, I’d like to see the protein percentage go up a bit to help increase activity, but at the very least this food is great to rotate into my pup’s diet. Simply Nourish is a very trusted brand, and I’m delighted Chewy now carries it. 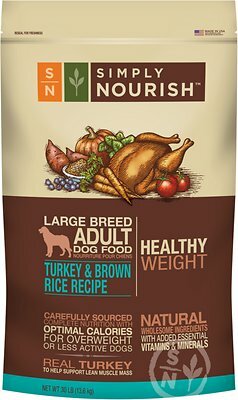 This is the only food that works for my pup to help loose weight and his itching has stopped too! We tried Authority food cause it was similar and his itching came back! We are definitely going back to this food. My boys have been eating this for a few years now. I’m Glad I can have it delivered now.